The Thermo Precision Mechanical Convection Oven PR205045M offers a uniform heat and reliable control in an easy to set benchtop design. This high-performance incubator uses a mechanical convection with a gentle blower that circulates heated air horizontally for an even distribution giving it a tight temperature tolerance of up to 0.3°C. Mechanical convection is an ideal choice for fast drying thanks to the directed airflow, drawing moisture with it. The microprocessor control of this thermo incubator displays the easy to read three character screen, and lets users set their desired temperature between 5°C above ambient to 75°C. Users may also set their alarm parameters that include temperature deviation beyond 3°C, which will trigger a visual alarm. This Precision Mechanical Convection Oven has a built in back up heater if the primary fails, power surge protection, and a solid insulated door that opens 180° for easy access. The chamber is also covered with a tempered glass door that allows users to inspect their samples progress without disturbing the incubator’s environment. The interior of this convection oven is a easy to clean stainless steel, with adjustable shelving and a electrical outlet for peripheral instruments such as a shaker or stirrer. 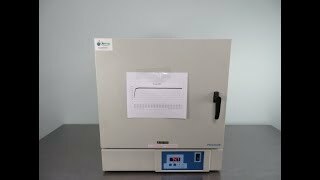 This Thermo Precision Mechanical Convection Incubator PR205045M has been tested at 37°C and at its maximum temp of 75°C. Incubator passed all tested with a clean bill of health. All of our lab equipment comes backed with our standard warranty. Should you have any questions about any of our incubators, please don't hesitate to contact us.